Lower-income countries are less likely to send representatives to meetings of multilateral forums on nuclear disarmament, they will tend to field smaller delegations, and they will make fewer individual statements on average than richer countries with an equal right to participate. 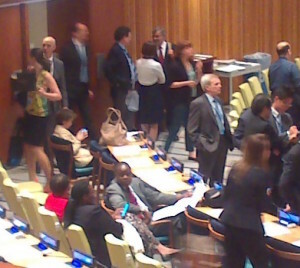 These are clear trends in available attendance and participation data on meetings of the Treaty on the Non-Proliferation of Nuclear Weapons (NPT), the Comprehensive Nuclear-Test-Ban Treaty (CTBT), the Conference on Disarmament (CD) and conferences on the Humanitarian Impact of Nuclear Weapons (HINW), which Article 36 has analysed for a new discussion paper. The underrepresentation of low-income and non-Western countries – and civil society – in these forums is significant. Nuclear disarmament is a global concern: the interests of all countries must be represented for any attempt to achieve the most equitable outcomes for populations worldwide. Low-income countries may, overall, have different perspectives on nuclear issues compared to richer countries. This is suggested by the high proportion of low-income countries that are part of a nuclear weapon free zone, in comparison to the considerable number of high-income countries that are part of a nuclear alliance. Given this, discussion and outcomes may currently be skewed in favor of certain framings and technical perspectives that place more value on nuclear weapons. The extent of low-income country underrepresentation varies across nuclear disarmament forums and the different sessions within particular meetings, increasing for sessions that address more specific topics in comparison to general debates (the pattern of participation in general debates at NPT meetings 2010-14 is shown in the figure below). 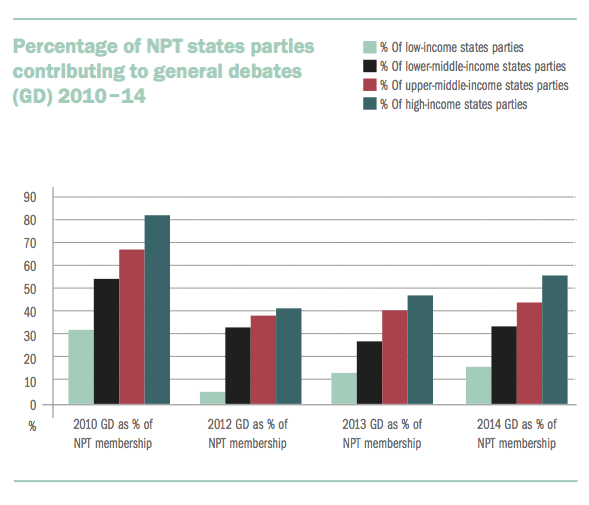 For example, the percentage of low-income parties to the NPT making a statement to the main committees, clusters and specific issues was only 1% on average across all NPT meetings between 2010 and 2014. At several of these individual sessions, no low-income countries contributed at all. The factors that may inform these trends, from the technical and material capacities needed to attend to the perceived utility of different forums, will be the subject of further investigation. Greater equitability between countries in multilateral forums however is important in principle – as well as having the potential to change dynamics. Future initiatives to advance nuclear disarmament, such as the commencement of negotiations on a ban treaty, must proceed on this principle. Such processes must also not be blockable by any particular country: requiring complete consensus can induce deadlock, and is not the same as upholding open inclusion. Where better representation is achieved, in terms of both quantity and quality of participation, discussions may have a greater chance of generating a more balanced debate and a larger range of proposals to address global disarmament concerns. This discussion paper is part of a project to map and analyse low-income country participation across a range of multilateral disarmament forums. Comparative analysis will be also conducted between forums covering different subjects (e.g. small arms, cluster muntions) and on specific dimesions (e.g. gender) to examine how patterns of representation vary. This project complements current work by the International Law and Policy Institute (ILPI) to examine data on a selection of disarmament processes and improve inclusiveness based on this analysis. It also draws substantially on data and analysis compiled by Reaching Critical Will. The observations and analysis in this paper are provisional, they are for discussion and to provide a basis for further qualitative investigation of the factors behind the trends reported.